On a weekly basis, we have referrals for patients with impacted canines…meaning that their canines are stuck in an unnatural position. We typically see these cases in the teenage years… but sometimes we have patients that present to us in their 50’s and 60’s to address their impacted canines because now they have become an issue. 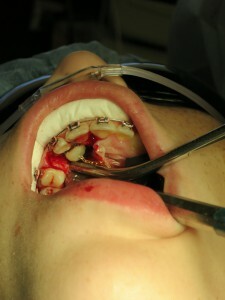 The older the patient, the less likely that the impacted canine can be brought into occlusion. If the attempts in retrieving a canine is unsuccessful in an patient, they the canine is typically extracted, in order to be able to place an implant to replace this missing tooth. It is not possible to place an implant, without the removal of the impacted canine, since the implant will be place in the same location and vicinity of the impacted canine. The case below highlights the importance of treating these condition in a timely fashion, in order to obtain the best aesthetic results. This case was performed in 2011 in a child around the age of 11, around the age that we would expect her adult canines to erupt….unfortunately in this case it had not. As a general rule, every attempt should be made to save the canine tooth, as it serves as the “pillar” of our dental occlusion. What most people refer to as “canine function” is solely based on the presence and function of the canines – which means that when your teeth occlude against one another, the actual touching of the upper and lower canines versus one another, allows the rest of teeth to disengage or disarticulate. This is very critical in conserving the teeth and preventing excessive wear of the cusps. This is why the canines are the longest teeth in the mouth, with the longest root…they are designed to take the brunt of the biting forces when the teeth come together. On closer inspection of the intraop images above, you are see that the impacted canine was stuck in the roof of the mouth, which is where they are usually found – but sometimes they are found on the buccal, meaning in the front of the teeth, on the opposite side. This is why sometimes when we cannot palpate or locate the position of the impacted canine – a CBCT is required to know exactly the position of the impacted canine before surgery. 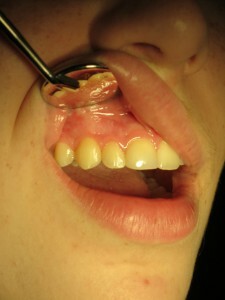 The patient presented back today, four year later after completing her orthodontics. Look the perfect alignment of her teeth and the canine in the panorex below. 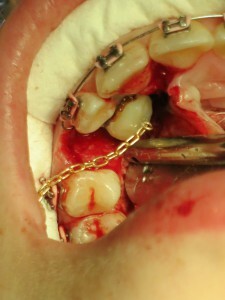 The canine was completely brought down into her occlusion by her orthodontist. The patient has adequate attached gingiva around the tooth #6 in order to prevent recession in the future. This is the advantage of treating impacted canines at an early age. We hope, and we strive for these types of results. With proper timing and sequencing of procedures, we were able to bring a completely impacted canine back into occlusion and function, for the rest of this patient’s live – without damage to the adjacent teeth and/roots or any of her adjacent bone and/or soft tissue. 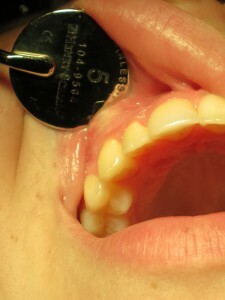 Now were going to be addressing her impacted third molars, at the proper age as well. Before there is full development of the roots…leading to further complications in the future when she gets older. The older the patient, the longer the roots on the the third molar…the more the risk of nerve injury or other complications. You can already see at the age of 15 that the axis of the erupting third molars are off (as seem by the red arrow). 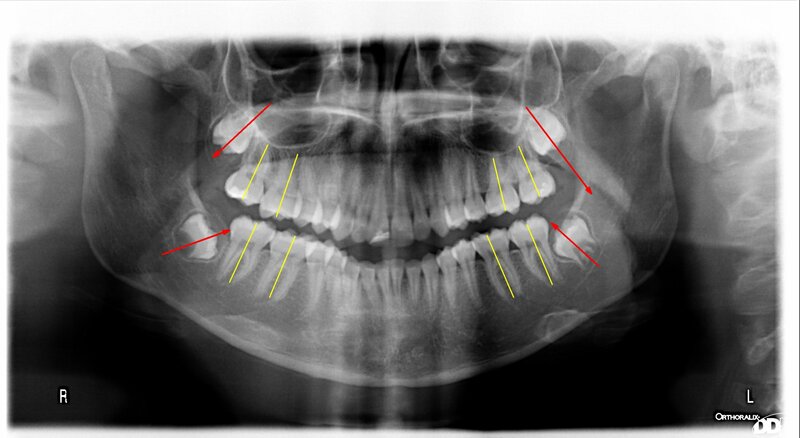 The axis of the third molars should be somewhat parallel to the axis of her molar teeth (as marked by the yellow lines). Typically when these third molars are let in place, their positioning will worsen and sometime becomes completely horizontal (lay on their side) causing bone loss and damage to the adjacent tooth; the second molars. When the third molars are removed at an early age, we do not see any damage to the adjacent teeth and tissue that may require further work and expense to fix. Colorectal Cancer: Vegetarian Diets Are Associated with Lower Risk for Colorectal Cancer!